1944 Melrath Supply & Gasket Co., Inc.
for alcohol, solvents, air, ammonia, chemicals, steam, water." 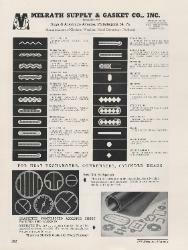 1958 Melrath Supply & Gasket Co., Inc.
page. This ad features many products, including Style No. Gasket with asbestos filler and flat metal top; Style No. Jacketed Metal Gasket with asbestos gasket filler; Style No. 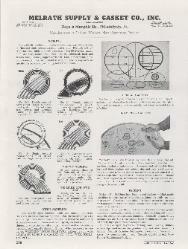 Melrath Supply & Gasket Co., Inc.